Hawaii has been combatting an explosive outbreak of dengue fever and has earned the Centers for Disease Control and Prevention&apos;s support as it works to combat the rising case numbers. By the end of October, there were two reported cases of the disease on Hawaii Island. As of Tuesday, the Hawaii Department of Health is reporting a total of 117 confirmed cases of dengue fever, 14 of which were detected in visitors to the Big Island and 103 of which were found in Hawaiian residents. The outbreak is particularly troubling considering mosquitoes are not native to the Hawaiian Islands. What&apos;s more, mosquitoes, and the diseases they spread, aren&apos;t just affecting the health of Hawaiian people; they&apos;re also damaging the animal populations that inhabit the islands. "The Hawaii Department of Health is investigating a cluster of locally acquired cases of dengue fever on Hawaii Island," reads a statement from the department. "Dengue is not endemic to Hawaii. However, it is intermittently imported from endemic areas by infected travelers. This is the first cluster of locally acquired dengue fever since the 2011 outbreak on Oahu." According to the the U.S. Geological Survey, "Native Hawaiian birds have been decimated by introduced, mosquito-transmitted avian malaria and pox." Though common in most continental areas, mosquitoes are not native to many oceanic islands. The southern house mosquito Culex quinquefasciatus occurs throughout the subtropical and tropical regions of the world. It is often associated with manmade habitats and was spread widely through commerce. It was the first mosquito to arrive in Hawaii, having been introduced in 1826 when, presumably, it was brought ashore in water casks from a ship recently sailed from Mexico. Since the species was first introduced, the number of biting mosquitoes species in Hawaii has risen to six. Yet per the Hawaii Department of Health, only two species of mosquitos, Aedes aegypti and Aedes albopictus, are able to carry and transmit the virus that can cause dengue fever. Once a person is infected, symptoms include high fever, rashes, muscle pain and pain behind the eyes. The CDC details a full list of symptoms associated with dengue fever. To raise awareness, the Hawaii Department of Health has launched the #FightTheBite campaign, which launched about a month ago and aims to educate people on how to prevent the spread of the disease. 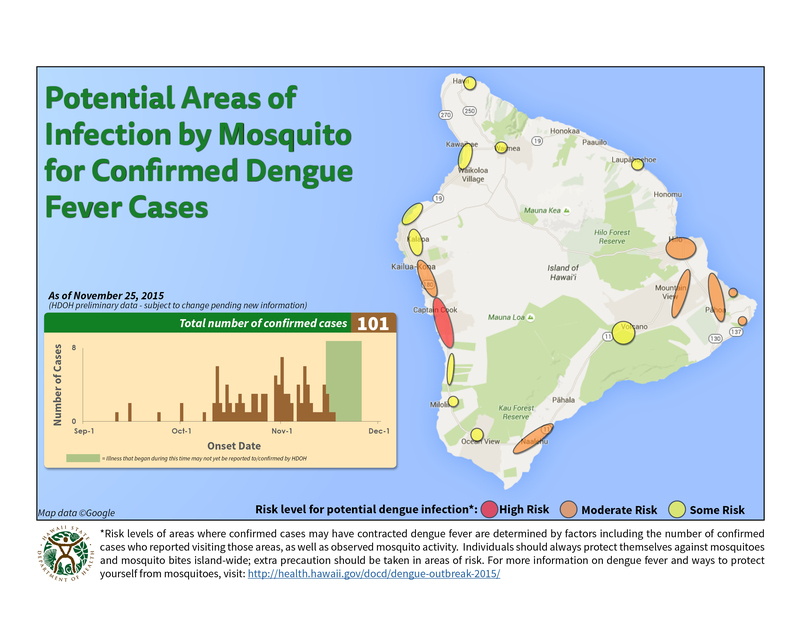 "HDOH continues to routinely monitor for cases of imported dengue infection on all islands and will continue to have Vector Control perform mosquito site assessments and abatement as needed," reads the Hawaii Department of Health statement. "Since the beginning of our current investigation on Hawaii Island, one imported dengue fever case has been confirmed (on Oahu). This case is not associated with the Hawaii Island investigation." Here&apos;s a map detailing the varying degrees for risk of infection on Hawaii Island, the largest of the eight main islands that make up the archipelago state.